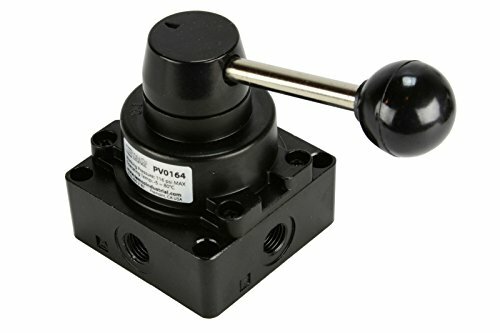 TEMCo Industrial pneumatic air control valves feature a variety of manual actuators that allow the user to quickly change between a set of directions of flow, also known as "positions," in order to control the flow of pressurized air through desired ports. Thus, any single direction of flow, or "way," can be altered with a simple flick of a switch, press of a button, twist of a knob, or turn of a lever, as well as other manual options. Application of these control valves are suitable for any pneumatic task, from DIY projects at home to burly industrial use. With varying port sizes from 1/8", 1/4", 3/8", and 1/2" NPT, diverse valve body sizes and forms, as well as pre-drilled mounting holes through the body of the controller, you're bound to find the right TEMCo pneumatic controller for your needs. The most important feature to look for is the actuating type - the way in which you manually control the valve. Whether the controller you're currently looking at on this listing is or isn't the right one for you, take a moment to check out the other pneumatic control valves in our line and see if any of those and their features are better suited for your particular application. A tactile detented hand lever can be used to open and change the direction of flow. Positions are marked "N" as the closed center, and "0.1" and "0.2" as the two open positions. A closed center means the valve will not allow the flow of air in its center position. Can be mounted through four corners of the valve's body. Maximum operating pressure of 116 PSI.